Listed here are some featured Pioneer events. The Royal Pioneer Corps War Memorial was unveiled and dedicated on 14 June 1964 at an impressive service at Simpson Barracks, Northampton on the occasion of the Corps Weekend. Erected near the entrance to the barracks the Memorial, which is simple in design is built of Cotswold stone and bears two plaques. One shows the Corps Crest and the second one pays tribute to the 8,600 Pioneers who gave their lives in the service of their country in World War !! and also shows all theatres where Pioneers died. The form which the Corps Memorial should take had been under discussion for some time and many varied suggestions have been investigated by the Association Council. Many questions such as what would be acceptable as suitable as a Memorial, the durability of the Memorial, the site and the cost had to be carefully examined before a decision on the present form could be made. The stonework was designed by Lt Col Jimmy Adamson who also directed the construction, while the plaques were designed by a small committee of the Association headed by Lt Col C F Walker, Commandant of the Depot. Serving Pioneers and member of the AER assisted the skilled mason in preparing the foundations and building the Memorial and rose gardens, which will eventually surround the stonework, will be tended by members of the Depot staff, making this a true Pioneer Memorial. After the serving personnel and the old Comrades had marched to the service, which was held around the Memorial, the unveiling was carried out by the Colonel Commandant who, in his short address, paid tribute to those who had died in World War II. Then, turning to the soldiers on parade, the Colonel Commandant told them that, in the same way as Pioneers in the past had laid down their lives, the Pioneers of today must be prepared at all times to make the supreme sacrifice. The Memorial was dedicated by the Padre, G P H Rowson CF, Chaplain to the Royal Pioneer Corps, after which a wreath was laid by the Colonel Commandant on behalf of the Pioneers present and past. After the service, all those on parade marched past the Colonel Commandant headed by the Corps of Drums. 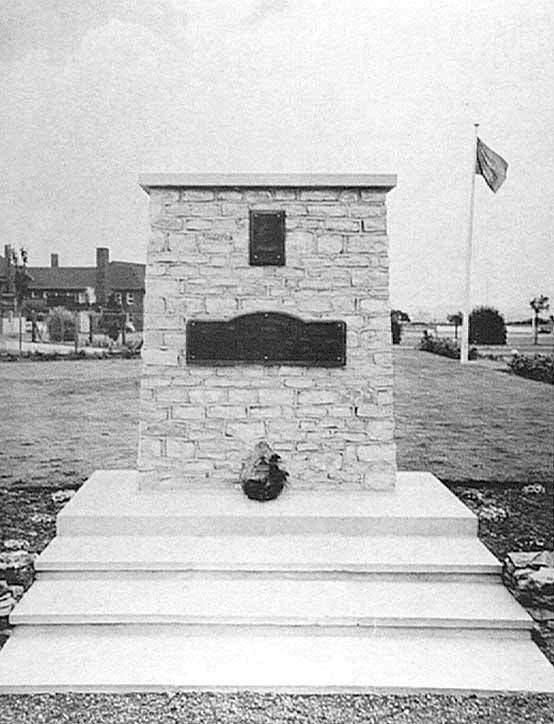 The Memorial is now sited outside the guardroom at St Davids Barracks, Bicester.